This fee is based on your requested rental equipment. This includes Labor Cost to Load, Unload, Transport, Set up, Break down and Clean all rented Equipment both before and after your event. We take great pride in the appearance and maintenance of our equipment to ensure the highest quality service available. 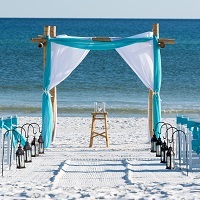 This fee also includes Raking the Beach at your set up location for all full-service ceremony packages.